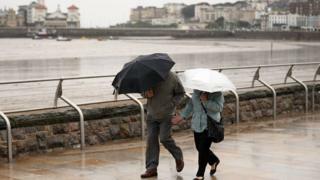 The UK is likely to continue to have soggy summers regardless of global warming according to a new study. Scientists say that greenhouse gases will cause a general rise in summer temperatures, over the course of this century. But they argue, it is random shifts in Atlantic storm tracks that determine whether our summers are hot and sunny or cool and wet. The study has been published in the journal Nature Geoscience. One of the big challenges for climate scientists is to work out how warming at a global level translates down to regional or local impacts. Researchers are also trying to understand the relative impacts on climate systems of internal and external factors. Greenhouse gases, volcanic eruptions and solar irradiance are all external factors that can impact the climate - but there is also internal variability which is caused by natural processes within the climate system, such as El Niño. In this study, researchers attempted to tease out some of these questions in relation to the summer climate over Europe for the past 1,000 years. Using measurements from instruments, information from tree ring records and lake sediments, the team was able to build up a detailed picture of temperatures rising and falling across the continent as a whole, linked to changes in the bigger pictures such as volcanoes, rising emissions of warming gases and energy from the Sun. But when they looked at the temperature differences between northern and southern Europe, they found that these were influenced far more by the position of the summer storm track across the Atlantic. When it veered north, the UK was wet and soggy while southern Europe was hot and dry. When it turned south, the north was sunny and warm. "The position of the storm track coming in over the Atlantic and hitting Europe is not related to the climate forcing factors such as greenhouse gas emissions and solar variability," said lead author Dr Mary Gagen from Swansea University. "The history of past 1,000 years is of that storm track position wandering around." The authors argue that while global warming will continue and is linked to emissions of greenhouse gases, the effect of variable factors like the storm track can act for or against this underlying rise. "We may have rising temperatures in a predictable way, but every now and again the climate systems in this part of the world can roll the sixes on a dice, of very cold wet summers or very warm dry summers," said Dr Gagen. "There is no predictable element to that at all." The researchers say that these factors are important because they can influence the general public's perceptions of global warming. Newspaper reports on climate change in the UK have often painted a positive picture, suggesting that farming will benefit and vineyards will commonplace. However this study suggests that the long, hot summers of a warmer future are unlikely. "If you look at the energy balance of the whole Earth, if you increase CO2 it has to get warmer," said co-author Prof Danny McCarroll also from Swansea University. "But what people really experience is what happens where they live and there is much more of a random component. One part is forced and one part is random and the smaller the spatial scale the more important the random side is." "This really impacts on people's perceptions of climate change - if you get 3 or 4 hot summers in a row, people will say global warming is real, but if you get 3 or 4 wet summers, people perceive it as not warming, when the average temperature is still going up." Much of the data for this study was produced by the Millennium Paleoclimate project, involving almost 40 institutions across the European Union. But one key question that has not yet been answered is how the current period of warming could impact the future movement of the Atlantic storm track. "They couldn't find any signal of the forcing to explain these changes to date," said Dr Pablo Ortega from the University of Reading, who wasn't involved with the study. "But it doesn't mean that this shift in the storm track won't be responding in the future to the greenhouse gas increase." Dr Ortega is hoping that this type of research will evolve so that the random changes of the storm track could also be incorporated into forecasts, something he admits is still a significant challenge. "In Europe, if we can see in the models there is going to be a consistent change then we would know how to adapt." "But that could be too optimistic."